Don’t buy burritos anymore! Make them yourself with delicious, nutritious ingredients to fill you and nourish you. In a large mixing bowl, combine the quinoa, black beans, corn, salsa and cheddar cheese. Lay tortillas out onto a clean work surface then spread 1/4 cup bean mixture down the middle of each tortilla. To roll: Fold one end of the tortilla to meet the other. Gently push back the tortilla and ingredients so they are tight. Fold outside edges inward, then roll until burrito is closed. Repeat the process with the remaining burritos. Tear 12 sheets of foil. Place a burrito in the center of each piece of foil and tightly roll up. Place foil-wrapped burritos in a freezer bag. Label and date them before storing them in the freezer. 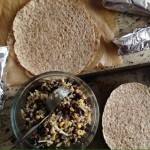 Remove burritos from foil and place on a microwave-safe plate. Cover and cook on high heat for about 1 minute. Check and add more time if necessary. If you’re unsure, use a food thermometer and cook until internal temperature reaches 165’F.